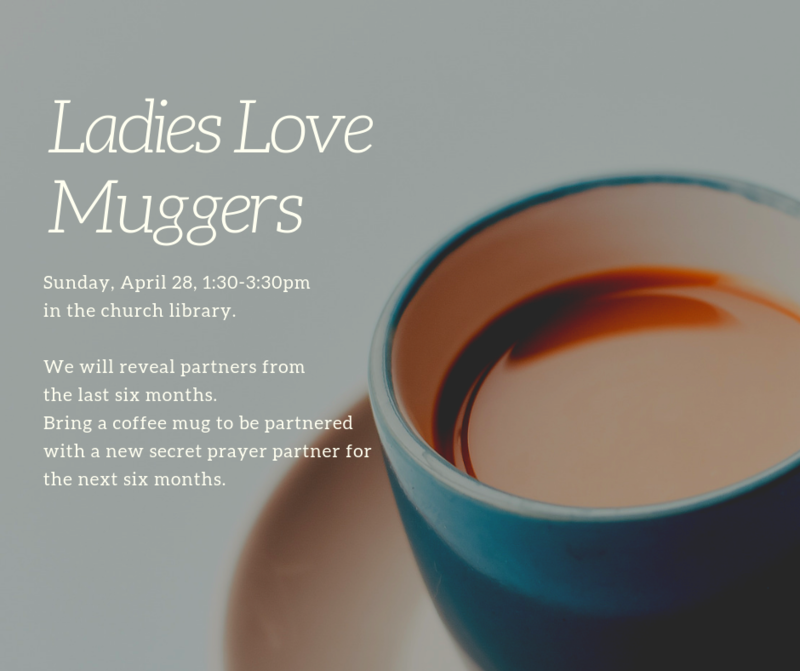 Love Muggers to REVEAL Sun., April 28 @ 1:30-3:30pm in the Library off of the Commons. To participate for the next six months, just BRING A MUG, and we will help you with the rest! Love Muggers meet every six months, once in April and once in October. We have a special cubby that we pass cards/gifts to one another, to encourage your love mug sister AT LEAST once a month. Another way to engage with your Christian sisters. This “REVEAL”, please bring a small treat to share with the group (drink provided). After reveals have been made, each will draw a mug from the mix “as a reminder of the person we are praying for” the next six months. All ladies of the church are welcome to JOIN US!! !